This is a quick and easy cupcake with a Christmas twist. You probably have everything in your pantry to make these cupcakes today. I used box cake mix, but feel free to make the cake from scratch. If you use box cake mix, I recommend Duncan Hines - I always get the best cupcakes from Duncan Hines. These cupcakes tasted amazing. The hint of peppermint in each bite really put us in the Christmas spirit! I took some of the cupcakes to work and they were gone before I knew it. Prepare Devils Food Cake batter. Set aside. Prepare White Cake batter. Stir in 1 teaspoon of peppermint extract. Divide the batter in half. Stir crushed candy canes into one half of white cake batter. Line cupcake pan with paper baking cups. 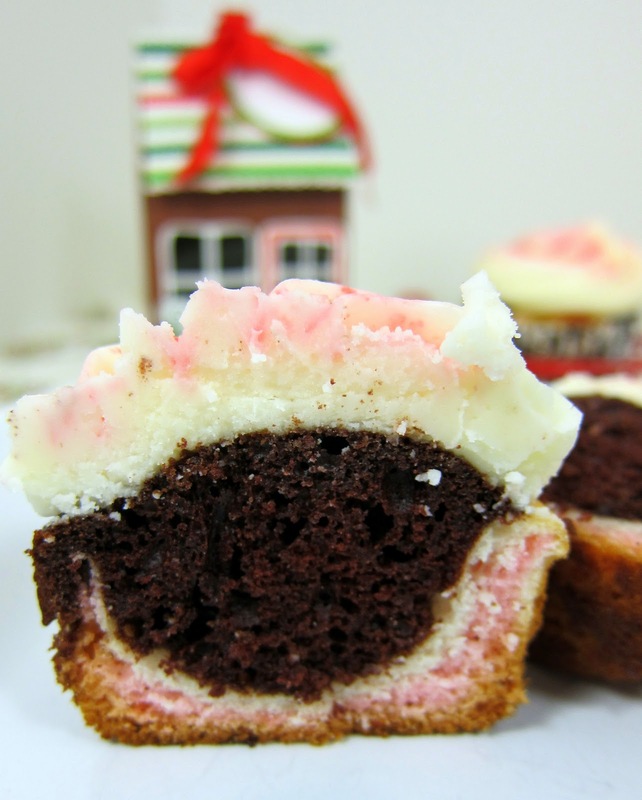 Scoop one Tablespoon of candy cane batter, one Tablespoon white cake batter and 2 Tablespoons of Devils Food cake batter into each cupcake liner. Bake according to package directions. Cool completely. and frost with Peppermint Buttercream. In the bowl of an electric mixer fitted with the paddle attachment, cream butter until smooth and creamy, 2 to 3 minutes. With mixer on low speed, add 6 cups sugar, whipping cream, and peppermint extract ; mix until light and fluffy. If necessary, gradually add more powdered sugar or whipping cream to reach desired consistency. Peppermint and chocolate were made for each other, especially in cupcakes. These cupcakes are melt-in-your-mouth good and definitely do justice to the chocolate/peppermint pairing. The chocolate cupcakes by themselves are delicious, incredibly light and moist. Thanks for sharing the information about this yummy cupcakes.